Rome is regarded as one of the most impressive cities in the world for good reason. With an overwhelming number of ancient sites, spectacular viewpoints, and tranquil green spaces, it’s also one of best cities to run in. Running in Rome will give you the chance to experience the city in new ways. Market vendors set up first thing in the morning, while candlelit tables create a glow after dark. Busy piazzas lead into serene neighbourhoods and museums are often just a stroll away from quiet parks. You can choose to follow trails that wind through woodland and forget that you’re in the middle of a city. Or you can sprint past historic buildings before the streets have woken up. Pizza, pasta, wine, and gelato are almost impossible to avoid in Rome. But if you plan to indulge in all of the deliciousness, you might as well use the extra calories for a few long runs. Running is also a great way to pack in sightseeing at a faster pace. But when it comes to visitors, Rome is an exceptionally popular city. Most runners will find central Rome’s crowded streets frustrating, while the traffic-clogged roads can be difficult to navigate. Luckily, there are quieter running paths in Rome. A cycling and running path cuts through the city’s scenic center, set alongside the River Tiber. Meanwhile, there are lots of leafy parks around the city and running the Appian Way has become increasingly popular. The following five running routes will take you through beautiful parts of Rome while avoiding the crowds. Running alongside the Tiber River is a much more relaxing experience than running at street level. Although the route cuts through central Rome, it keeps you well away from cars, speeding scooters, and terrifying intersections. A flat cycling and running path, the Tiber route stretches for 32. 7 kms, on the West Bank of the river. The path starts in the suburbs and passes some of Rome’s historic highlights. If you want to end up in Central Rome, start south of the Olympic Stadium and run south to Ponte Guglielmo Marconi. This section of the path is approximately 11kms and takes you through some of the most popular parts of the city. You can make the route shorter or longer, by crossing over the bridge and running back up the other side, along footpaths. There are various metro and bus stops near the Tiber River running route, so it’s easy to access. Villa Borghese is one of the largest parks in Rome. Covering 148 acres of gardens and parkland, Villa Borghese is a peaceful expanse of green in the centre of the city. Leafy trees provide shade and it’s particularly beautiful in the evenings when a blanket of golden light falls over the park. A refreshing escape from car-filled roads, Villa Borghese is a safe place to run. It’s also big enough to change up your route if you run there more than once. 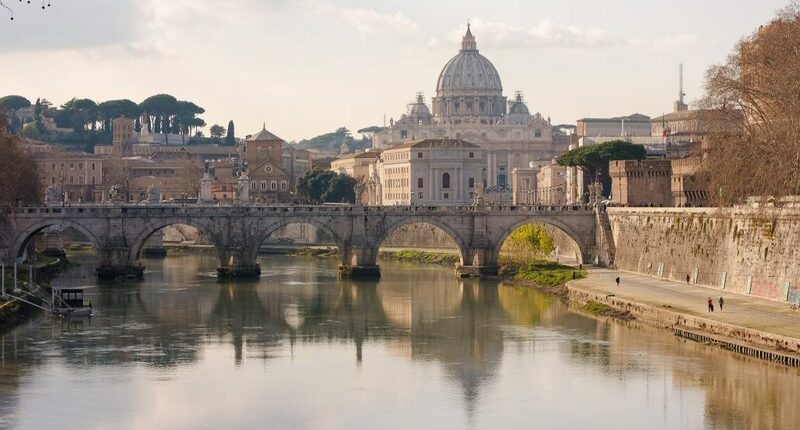 Highlights of the park include the famous Galleria Borghese, manicured gardens, fountains, and a boating lake, and you can loop your way around all of them. At sunset, stop for a breather at Pincio Terrace and take in the views. You can look out over Piazza del Popolo and the Prati district beyond, all dominated by the spectacular dome of St Peter’s Basilica. Located in the northern part of the city, Villa Ada Park is a haven of nature and greenery. Covering 450 acres of woodland and parkland, it’s one of the most popular places to go jogging in Rome. Villa Ada is a much wilder park than Villa Borghese, so running here feels like a true escape from the city. There are various routes to try on gravel paths and dirt tracks. Run through the open park, do a couple of laps around the artificial lake, then jog through shady woodland. You could tackle the hills for a more intense workout. Or for a longer distance, combine your run in Villa Ada with a route through Villa Borghese. Campi Sportivi and Monte Antenne are the nearest train stations, while Libia is the closest metro stop. The largest park in the city, Villa Doria Pamphili is a magical place to go running in Rome. The park is centered around a large, 17th-century palace. Garden mazes, fountains, and paths are meticulously laid out. There is about 10 km of trails in Villa Doria Pamphili, as well as some outdoor gym equipment. So there are plenty of opportunities to work out here, before a day of exploring. 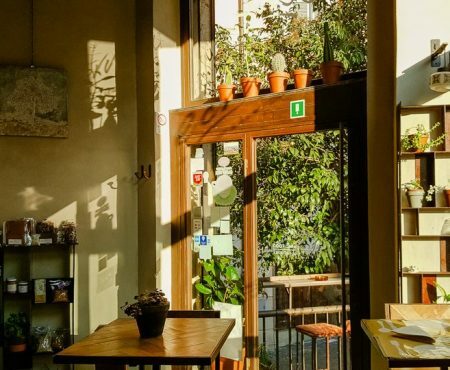 Via Doria Pamphili is located near Trastevere, one of Rome’s prettiest neighbourhoods. You can also walk or run to the park from the Vatican and it’s open from 7 am to 9 pm. Most Rome running routes are far from ordinary, but Via Appia is truly special. Running the Via Appia, or Appian Way, is a chance to combine exercise with culture. One of Rome’s most historic areas, Via Appia is lined with catacombs, villas, and tombs. The road was originally constructed in 312 BC, as a route to Southern Italy. These days, the area is a protected park and farmland surrounds the ancient sites. The Appian Way Park Authority is a good place to begin your run. But bring water and food, if you’re planning to make it a day trip. The 118 bus, which leaves from Piramide Metro Station, will take you to all of the main sections of Via Appia. Is it safe to run in Rome? Running is popular in Rome, so it’s unlikely you’ll find yourself completely alone on any of the above routes. Villa Ada and Villa Borghese are busy parks, particularly at weekends. But it’s always best to run in daylight hours, especially when you’re unfamiliar with a city. In Italy, the weather will play a big part in how comfortable your run is. Summers in Rome are hot and dry, with temperatures reaching 32°C in July. So run in the mornings and evenings, when the air is cooler. In January, I found the weather ideal for outdoor exercise. Almost every Rome local I passed was running in gloves and layers of lycra. But if you come from a colder climate, you’re unlikely to need anything heavier than a t-shirt. Thanks for this information, I’m visiting Rome in June and planning to run there. Do you know of run clubs or best way to join locals on a run, it will be even better to go to these places and meet some locals too.